Unleaded petrol prices are set to overtake those for diesel for the first time in over a year, largely as a result of Storm Harvey in the US. Prices for unleaded are set to overtake diesel next week. According to the RAC, the impact of the storm and the shut-down of large refineries in the Gulf Coast is driving up US demand for petrol imports. As a result, the price of a litre of petrol could rise by up to 4p per litre, which would take the average price of the fuel above 121p per litre – a price not seen since December 2014. 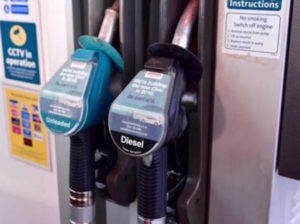 The increase would also mean the average price of a litre of unleaded moves above that of diesel, something that has not been seen in the UK since early June 2016, with the RAC warning that the situation could continue for some time to come or at least until the US oil industry can get refineries back into operation.